Vedantu.com - No.1 online tutoring company in India provides you Free PDF download of NCERT Solutions for Class 11 Physics Chapter 10 - Mechanical Properties of Fluids solved by Expert Teachers as per NCERT (CBSE) Book guidelines. 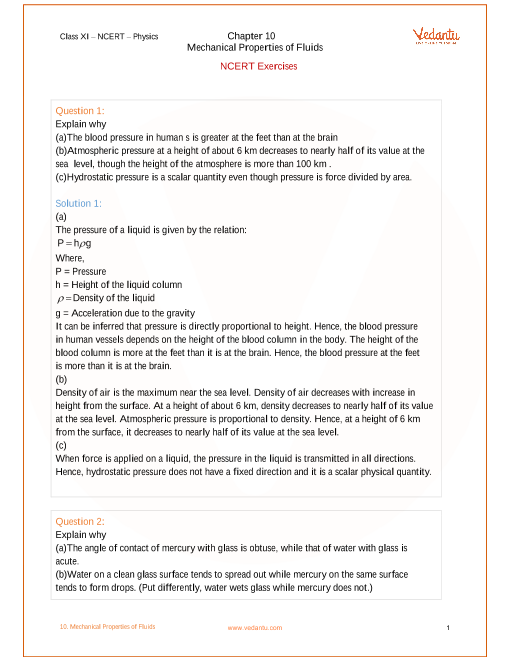 All Chapter 10 - Mechanical Properties of Fluids Exercise Questions with Solutions to help you to revise complete Syllabus and Score More marks. Register for online coaching for IIT JEE (Mains & Advanced), NEET, Engineering and Medical entrance exams. NCERT Grade 11 Physics Chapter 10, Mechanical Properties of Fluids is a part of Unit VII, Properties of Bulk Matter. This chapter is from Part 2, Physics NCERT Grade 11 Physics. In this chapter, we shall study some common physical properties of liquids and gases. How are fluids different from solids? What is common in liquids and gases? The difference between gases and solids or liquids, are some of the questions answered in this chapter. Also, effect of external forces such as pressure and tension on fluids is discussed with the help of mathematical expressions in this chapter. Pascal’s law, Variation of pressure with depth, Atmospheric pressure and Gauge pressure, hydrostatic paradox, hydraulic machines, streamline flow, equation of continuity, Bernoulli’s principle, Speed of Efflux: Torricelli’s Law, Venturi-meter are the technical concepts explained in this chapter. Fluids are a state of matter that are very closely involved with human body. Therefore, blood flow in our body and heart attack are some of the biological phenomena studied through the NCERT Grade 11 Physics Chapter 10, Mechanical Properties of Fluids. body. Therefore, blood flow in our body and heart attack are some of the biological phenomena studied through the NCERT Grade 11 Physics Chapter 10, Mechanical Properties of Fluids. Dynamic life, viscosity, Reynold’s number given by Osborne Reynolds, critical velocity, surface tension and surface energy, angle of contact, drops and bubbles, capillary rate, detergents and surface tension are the concepts that explain physical properties of fluids under different circumstances, their causes and their effects. Fundamental laws, mathematical expressions and derivative equations for cumulative understanding are explained in this chapter. Unit VII, Bulk of Matter along with Unit VIII and Unit IX are for 20 marks in the Grade 11 final examination according to the latest pattern. Get 100 percent accurate NCERT Solutions for Class 11 Physics Chapter 10 (Mechanical Properties of Fluids) solved by expert Physics teachers. We provide solutions for questions given in Class 11 Physics text-book as per CBSE Board guidelines from the latest NCERT book for Class 11 Physics. The topics and sub-topics in Chapter 10 Mechanical Properties of Fluids are given below. Ex 10.7 - Surface tension. Chapter 10 - 31 Questions with Solutions. Other than given exercises, you should also practice all the solved examples given in the book to clear your concepts on Mechanical Properties of Fluids. Download the free PDF of Chapter 10 Mechanical Properties of Fluids and take the print out to keep it handy for your exam preparation.